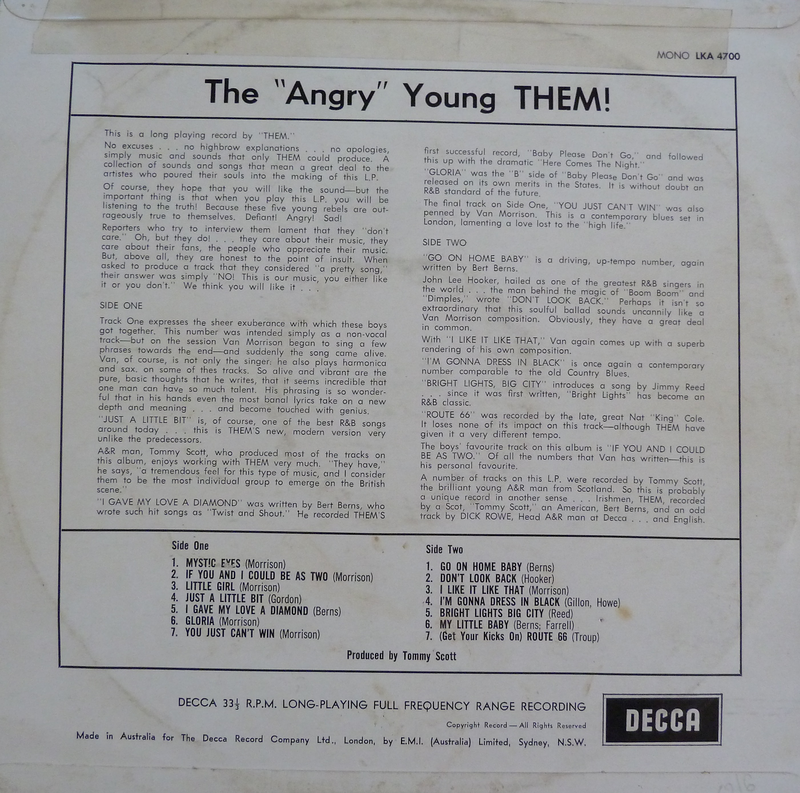 Up there with The Rolling Stones, The Yardbirds, The Animals, John Mayall - Northern Ireland's Them were as good a British blues band as there was. This was their debut album. Two great single tracks, "Baby Please Don't Go" and "Here Comes The Night" were not included as it was not the practice to put singles on albums so we got a short, ten track album without them. It doesn't suffer in quality, though. The sound is in superb, speaker shaking mono, forcefully sending a thumping, bassy sound right from the middle of your two speakers. "Mystic Eyes" is a great opener. "If You And I Could Be as Two" has a slightly self-conscious spoken intro before becoming a very Rolling Stones-ish track. "Little Girl" is a thumping, lascivious song in praise of a schoolgirl. That was perfectly ok in 1965. It has some Animals-style organ and some bluesy spoken vocals half way through. "I Gave My Love A Diamond" is another one with real echoes of the early Rolling Stones material, both in the guitar sound and vocals. Even the album's cover looked like The Stones' "England's Newest Hitmakers" album. The sound on this one is excellent, really powerful too. A real delight to listen to. Then we get "Gloria". Them's bluesy-voiced young singer, a guy by the name of Van Morrison, still performs this live all these years later. This was Them's finest moment. Of course, Morrison went on to have huge success as a solo artist, but these two and a half years with Them sowed the blues seeds into a furrow he would continue to plough for fifty more years plus. "You Just Can't Win" has shades of The Animals' "House Of The Rising Sun" about it in its guitar line. 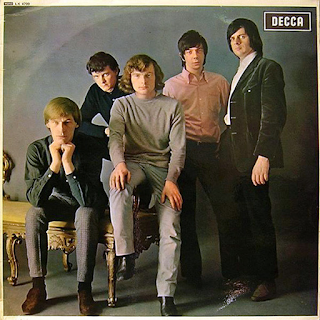 In the lyrics, they sing about Camden Town, Park Lane and Tottenham Court Road, rather like The Stones sung of St. John's Wood, Stepney and Knightsbridge. Another clearly Stonesy number is "Go On Home Baby". If I didn't know this was Them, I would almost think it was The Stones. 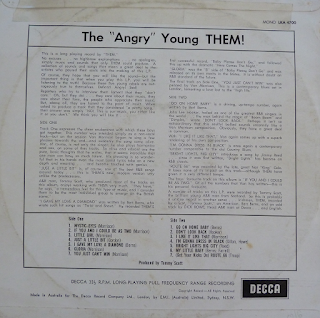 "Don't Look Back" features a keyboard sound that Them would use quite a lot, also on their cover of Dylan's "It's All Over Now Baby Blue". It is here that Van Morrison's voice finally sounds like Van Morrison more than anyone else, not Mick Jagger, not Eric Burdon. He is starting to form his own distinctive sound here. Admittedly he had done so on "Gloria" and on the two afore-mentioned singles, but there were definitely some where he sounded like others, so it is good to hear him developing that great Van voice for the first time. "I Like It Like That" is back to The Stones-influenced sound. "I'm Gonna Dress In Black" has that swirling Animals-style "Rising Sun" organ. "Just A Little Bit" is a rudimentary blues rocker based on a simple riff. They use saxophone on it, though, which was quite rare for these r'n'b groups. Morrison always liked the sax, and he always loved jazz, so that may account for it. "Bright Lights Big City" is one that sounds pretty authentically "Them", and it features some excellent guitar/organ interplay. "My Little Baby" is a bit of a "Here Comes The Night" remake. Their cover of "Route 66" is rocking and a great listen, but so close to The Stones version that again makes you think it's actually them. I have to say that quite a lot of this album is pretty derivative of other's material. It is a still an impressive debut album though and showed that the band had something, as certainly did their singer.